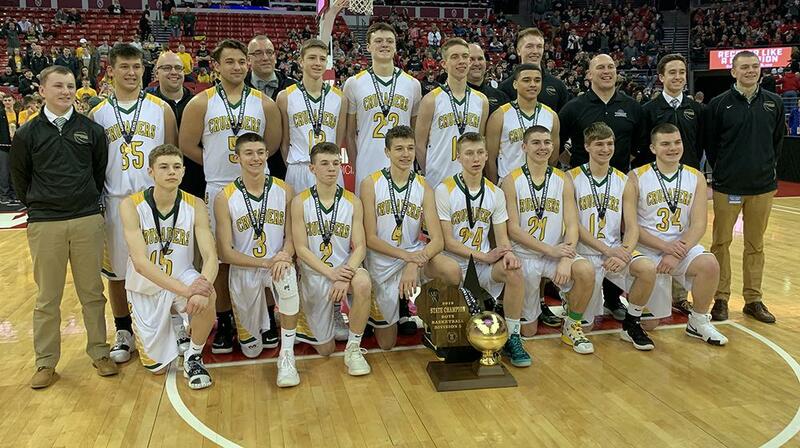 Sheboygan Lutheran coach Nick Verhagen admitted that this year’s team is not the most excitable group, even in the aftermath of winning the school’s second WIAA boys basketball state title. The Crusaders (27-2) scored the first nine points of the championship game, pouncing on a jittery Columbus team that missed one shot and committed three turnovers on its first four possessions. Sheboygan Lutheran built as much as a 20-point lead in the first half before leading 49-31 at the break. Ognacevic, the Crusaders’ 6-foot-7 junior center, proved his credentials with a 35-point, 19-rebound performance to finish his junior season. It was, however, a trio of young guards who provided the tempo throughout the game. Freshman Casey Verhagen tied the Division 5 single-game record with 11 assists, while fellow freshman Robby Michael came off the bench to score 10 points – including two three-pointers – in 17 minutes. Sophomore Jonah Jurss also started and chipped in four rebounds. It seemed that Sheboygan Lutheran was going to cruise to the award ceremony when it led by 16 at 64-48 with 5:53 remaining. The Dons had a few different ideas when they began to throw double-teams all over the floor. Columbus ground the lead down to 73-69 with 44 seconds remaining on Jared Mandel’s three-pointer, but Ognacevic’s three-point play and his additional free throw with 14 seconds left secured the state title, joining the school’s 2012 state championship won on Sam Dekker’s dramatic three-pointer. Ognacevic finished the two-game Division 5 state trip with 33 rebounds, which broke Dekker’s 2012 division record of 29. The record, however, belongs to Bryce Fuerlinger of Columbus Catholic, who added nine rebounds Saturday to his otherworldly 25-board total on Friday to finish with 34 for the tournament. It is Sheboygan Lutheran, however, who will take home the big prize – and maybe even give Nick Verhagen the opportunity to tell his team to savor the moment.